Juice Beauty strives to provide products that are free of chemicals and impurities. They achieve this because they only use certified organic ingredients to formulate their line of beauty products. Also, everything created by this company begins with an organic botanical juice base and is free of inexpensive fillers such as petroleum glycols or added water. Even better, most of the ingredients used in their products come from local West Coast USDA Certified Organic farms. This allows the company to dramatically reduce residue from pesticides, unnecessary synthetic chemicals, and synthetic fertilizer residue. In other words, she’s invented an organic, cruelty-free beauty formula based on solid science. Until April of 2018, the Signal Peptide line will be available exclusively at Neiman Marcus. The founder of the beauty company said that they chose to partner with Neiman Marcus because of how wellness has been incorporated into the store. Gwyneth Paltrow is the creative director of make-up for the brand. So, what is her favorite product from the brand’s new line? According to her recent Instagram post, Juice Beauty’s Flash Luminizer is currently her fave product at the moment. The Juice Beauty brand is still new to the public, but their products are taking off and the brand is quickly building a loyal fanbase that can’t live without these amazing organic products. Their entire line is built around the company’s strong eco-values. The brand provides products that are certified organic and created with sustainable practices whenever possible. We just can’t say enough good things about Juice Beauty. 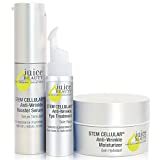 This Stem Cellular Anti-Wrinkle Solutions Kit is everything you need to fight the effects of aging, all wrapped up in one neat little package. Containing a blend of fruit stem cells and Vitamin C with a grapeseed base, these products are clinically proven to reduce the appearance of fine lines and wrinkles. 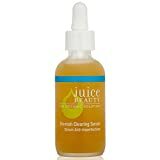 Juice Beauty Blemish Clearing Serum, 2 fl. oz. The Beauty Blemish Clearing Serum is just what you need to renew your skin for a healthy complexion. Created from CoQ10, Vitamin C, and organic aloe, this serum reduces breakouts, unclogs pores, and evens out your skin tone. 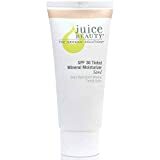 Juice Beauty Stem Cellular CC Cream, Natural Glow, 1.7 fl. oz. Skin Type: Normal, Mature, Dry. 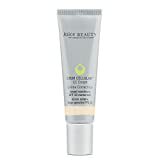 This Stem Cellular CC Cream evens skin tone and texture while reducing the appearance of fine lines and wrinkles. In addition, it provides your skin with mineral SPF 30 protection from harmful sun rays. This 12-in-1 multi-tasking CC cream goes far beyond the benefits of the average BB cream, delivering the ultimate in age defying, skin perfecting results. This miracle product is a skin perfecting foundation and age-defying serum in one that is created from plant-derived phytopigments. This full-coverage foundation gives you a noticeably smoother, more youthful looking appearance. If you’re looking for that flawless finish, this is the perfect formula. This tinted mineral moisturizer combines grape, aloe, and pomegranate juices to give you a radiant, even-toned complexion. In addition, it protects your skin from the harmful effects of the sun. Juice Beauty Cleansing Milk 6.75 fl oz. This formula uses grape seed and sunflower oils to cleanse your skin while organic chamomile and calendula soothe and replenish. After a long day, this creamy formula is pure perfection. Be the first to rate this post! blemish clearing serum 2 fl. oz.